As soon as I say this I will be corrected “but I was able to do HSS with Cactus and …. ” etc etc. So let me clarify. I’ve been working with the system for about 6 weeks now and I’m happy. The TTL is also, again, consistent and much in line with what the Nikon SB900 / SB800 used to offer on my old Nikon systems. Also the Canon XS – cable is the one you need to connect to a ProPak 960. I unpacked the 685, AD200 and XT-F on the same day and the first issue was firmware updates for the AD200 and AD600 to enable them to support the Fuji’s fully. This is not the easiest task with two different firmware loaders required (G1 or G2) – one to update the AD600 and another for the AD200. Another issue is the firmware uploader(s) only work on Windows based systems, which, as a Mac user made life really difficult as I could not even get the software to work on a parallels virtual machine. In the end had to resort to my partners windows laptop. Also note that the firmware(s) are very model specific – particularly the AD600 vs AD600M, these are not interchangeable as I found out! As with most other systems, the control signals are sent out on one of 32 channels (1-32) so the first stage is to set all of the units (flashes and controllers) to the same channel. X1T-F: There is a button marked CH, press this and rotate the dial. TT685: Press the Right-hand most button to enable one of the wireless modes and then one of the centre buttons is labeled CH, press this and rotate the dial. Next are the Groups. This is a way of enabling the trigger to fire multiple flash heads at different flash values. Setting a number of flashes to the same group will ensure they fire at the same setting. Setting flashes to different groups enables them to be fired at different settings (i.e. manual power, a TL ratio or turned off). As at the moment I have 4 lights, I have set each light to a different group to allow them all to be controlled individually from the trigger. The 2 AD200’s are on the first two groups as these are the most used off-camera units. The AD600 is on Group C as the trigger in the TT685 can only control Groups A to C (+ itself). The X1T can control groups A through E. All of my units have a letter on them to remind me of their setting. Once set, the output value on each flash may be set on the X1T trigger. Use the dial control to select (underline) the group to adjust. Press the GRoup button to select the group and with its value flashing, use the dial to adjust the output power (or TTL ratio). Press the GRoup button again to confirm the setting. The day I unpacked the units I had a photocall in the evening, a BBC photocall in a hotel for the new Dr Foster series. Biting the bullet, I took an AD200 (with the fresnel head), TT685 & X1T-F (after full testing obviously). My initial setup was to use a single camera with the X1T firing both flashes (mainly because I had not tried or tested using the TT685 as a controller). Having a bit of time to spare before the talent arrived, I was able to work out using the TT685 as a controller and so ended up with the “long” camera for headshots firing only the AD200 and the “standard” camera firing the AD200 & the camera-mounted TT885 for fill in. The really nice thing was having the AD200 fire at totally different values from one camera to another as I swapped between them (with no further input). Bertie Carvel attends a photocall for the BBC’s Doctor Foster at The Mayfair Hotel on Tuesday August 8th. Suranne Jones attends a photocall for the BBC’s Doctor Foster at The Mayfair Hotel on Tuesday August 8th. At the end of August it was my annual trip to Frightfest in London. I have been photographing the event for the organisers for 7 years now and a few years back we added live social media from the red carpet (using the iPad workflow). 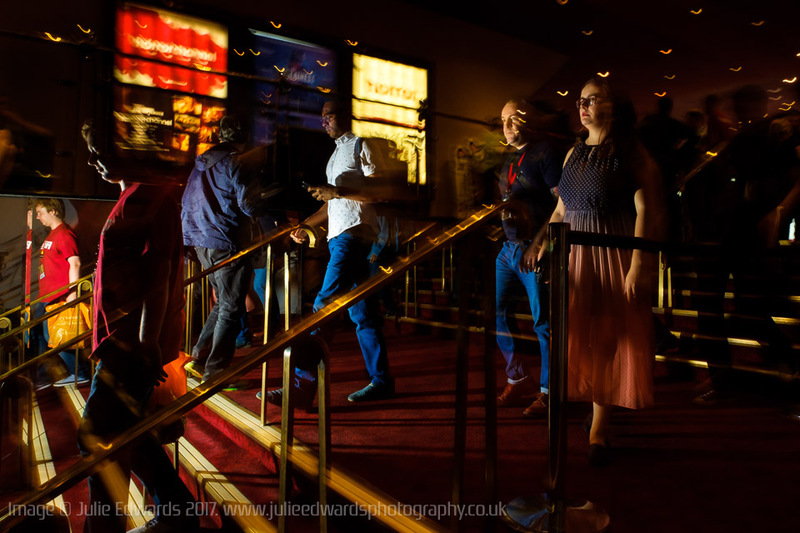 The festival runs over 5 days during during which I shot 41 separate “red carpet” photocalls. The setup was again an AD200 (this time with a standard reflector over the open bulb) with the TT685 for fill-in (and controller). The units were set to TTL (+0.7 & +0.3 to compensate for the white step & repeat board) and worked flawlessly for the many thousands of shots over the 5 days. I altered the direction of the shadows by moving & turning the subjects – i.e. more straight on and flattering for the women, turning away from the light for harsher shadows on the men. (easier to do when you co-run the media wall and so are able to fully direct it). The battery life of the AD200 was good, lasting a full day with an overnight charge and both units kept up with the 5fps, 3 frame burst I tend to shoot. One other thing I had not tried with the XT-2’s until this weekend was the additional sync mode’s, the flash control screen allows HSS, front curtain and rear curtain. HSS as I have mentioned before, allows better control of the ambient light whereas the two “curtain” modes control when the flash fires in relation to the shutter opening. Front curtain fires the flash as the shutter opens, freezing any action at this point and if the shutter is open long enough, leaves a trail of any moving object away FROM the frozen object. Rear curtain is the opposite, firing the flash at the end of the cycle so that the blurring leads TO the frozen object. I played with this a bit at night… using Rear curtain to capture “Frightfest Ghosts” moving through the foyer. When writing an article like this, it is so easy to miss points out but hopefully that gives you a good idea of how capable the Godox units are when used with Fuji system. Please ask any questions below via the comments and I will do my best to answer them all. Interesting to read about your adoption of Godox. I’ve made a similar switch recently and now have the X-1F with AD200, TT350 and the TT860ii. All working well so far and impressed with the quality for the price. First impression was that the build quality is fantastic for around £60 you can’t go wrong. (Better than the Nissin which I have now sold). You can also use it as a controller too which is a bonus. Obviously it’s not the most powerful but It’s nice and compact and great to have in the bag at all times. Recycle times aren’t the fastest but that’s when it’s working at full power. It was a good way to add a third flash should I need to as well. Julie, excellent article. Just curious are you able to get the Fuji System to trigger the Godox flashes off camera with the transmitter in continuous high-speed shooting mode (CH)? I’ve only been able to get off camera flashes using this system to do 3FPS and not 8FPS that is capable with the XT-2 or with the X-Pro2 or even the X100F. It does work however if one of the Godox flashes is on the hot shoe. Just curious. It’s frustrating!